Yesterday at Oracle OpenWorld I co-presented a session with Dipock Das on Siebel CRM and Rich Internet Applications. Dipock and I talked about how Rich Internet Applications are transforming the user experience in Enterprise Software. We also presented a proof-of-concept I built with Flex in about two days. Dipock and I were able to move from his paper-based mock-up and Siebel data file to a working application with only two short conversations and two days of coding. 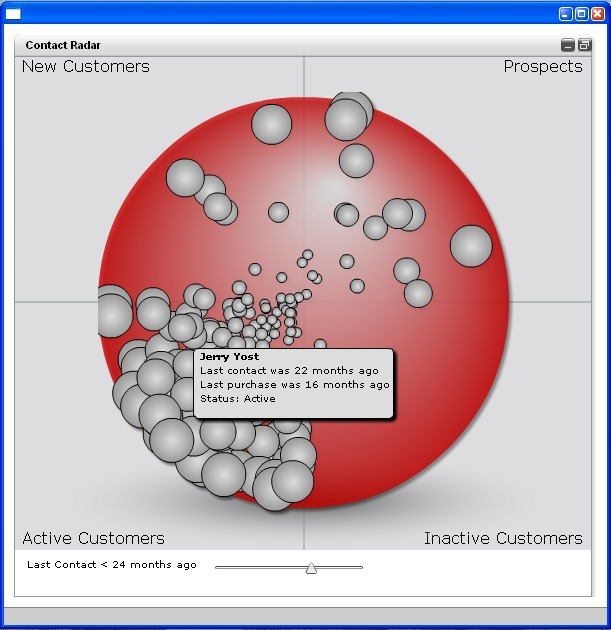 The application, named “Contact Radar”, allows sales people to easily see how long it has been since they were in contact with their customers and potential customers. Ultimately we wanted to illustrate how my four axioms of Rich Internet Applications – Connected, Alive, Interactive, and Responsive – relate to Enterprise Software. Connected – We demonstrated that the same application can run as a desktop application using Adobe AIR and as a web application using Flash Player. In the POC we showed that a Flex application can easily run offline and integrate with other offline concepts like native drag-and-drop to MS Office. The POC also connected to a Siebel web service to get its data. Alive – Dipock and I wanted to build an application with an interface that felt alive. We integrated natural world experiences like movement, shadows, translucency, and vectors deeply into the interface. Interactive – There are many ways that we interact in the natural world – voice, touch, sight, etc. One way we demonstrated this was to add Ribbit calling straight into the application. Responsive – In the natural world humans usually respond in less than a second. Web applications however usually make us wait for much longer than a second. In the POC we wanted to show how RIAs can have a sub-second response time for data operations like loading, rendering, and filtering. There are still more amazing Flex applications from Oracle. Stay tuned.